I used to wonder in my uneducated years, why Adolf Hitler, spread his forces so thinly, which ultimately cost him the war. It wasn’t until I learned about peak oil and the continued fight for energy resources that it became clear. Hitler was attempting to gain full control of Europe and Russia’s primary oil fields. This Nazi strategy to gain a full grip of Eastern Europe’s, North African and western Russia’s oil resources led to its defeat but had that gamble paid off back in the 1940s; then the world would be a very different place today. It would still be another 40 years before Britain would benefit from the current North Sea oil and gas bonanza, and it would only take two decades for that bonanza to peak by 2004 (not coincidentally when Heat my Home was born). This British North Sea bonanza also coincided with our 1980s economic prowess alongside the breakdown of the Soviet Union – not coincidentally. This economic meddling by governments on the Western side of the Berlin Wall caused the balance of global power to shift from East to West. The most significant mistake the US and Europe made, was to believe that we won the cold war. The Russian’s may have been down and out after the Soviet collapse, but after an internal power shift, they dusted themselves down, and the strategic games began once more. 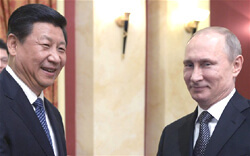 It is no coincidence that the rise of Russian and Chinese power over the 1990s and 2000s decades have occurred alongside each other. These governments have strategically aligned with each other to beat their long-standing enemies in our own capitalist game. As the West was basking in the glory that it had beaten the Soviet regime of the Cold War, behind the scenes, these two communist buddies have been strategising and implementing the downfall of the petrodollar that we all depend upon in the West. Unfortunately, we now find ourselves with a fast declining North Sea fields and now asking our old enemies to replace this shortfall. Mr Putin now holds all the Aces, and he knows it. The same goes for the Chinese government with other essential resources. Our dependence on these two nations and this power shift back from West to East has unbelievably achieved by using capitalism against itself. Now we find ourselves as a nation scared to upset Mr Putin or the Chinese government – who with a squeeze of his new ‘iron fist’, could cause Europe and the US petrodollar economies to go into hyperinflation hell. Not coincidentally, caused the rise of the Nazi Party within the German population in the 1930s. With a combination of geographical luck, strategic planning or both, the ability to drive your car, heat your home and pursue the American dream (think 51st state), now lies in the goodwill of a man with severe memories of an American induced collapse of his own once proud country. These generational war games have never gone away, however, what has changed is our modern day distractions within the populace and our British political system that cannot see any further than the next elections. The German people, however, do know the value of reducing dependence on external nations like Russia and this is why Germany is the most significant adopters of alternative energy technologies and once again leading the world technologically in the arena. Now we are all at the mercy of President Putin, but some nations and some households more than others. In this overpopulated world, the strategic planning going on in the war game rooms of the world, consist of not only securing dwindling oil and gas resources of the world but also the elements needed for technological prowess too. China understood this decades ago, and now they have secured most of the world’s rare earth metals, required to manufacture technologies like solar panels, which will be essential in a world needing to reduce dependence on no-longer abundant energy sources. Our western governments have now found themselves on the ‘back foot’ were rare earth resources are concerned, and now we find ourselves in a position where we have a double dependence on Russia for our ‘primary energy sources’ and China for ‘secondary energy sources’ for alternative energy technology. The cost of solar panels has been at an all-time low recently because China had been strategically flooding the world markets with cheap panels to put American and European manufacturers out of business. Luckily both the US and European authorities recognised this attempted monopoly and imposed import tariffs on these cheap panels to protect homegrown manufacturing. Had this not happened, then the ‘cheap panel bonanza’, would have ended homegrown manufacturing and China’s dominance in the global markets would be complete. Unfortunately for us, there will come a day when common sense will prevail, and those countries with their vast populations will ban exports of ‘vital limited resources’ for the benefit of their own citizens long-term. This common sense approach to energy conservation will leave the rest of us honestly in the cold. Think this won’t happen! India did something similar in 2008 with rice exports. These geopolitical moves caused the world rice prices to skyrocket overnight. Banning exports for the protection of nation’s citizens will become a standard practice over the coming years as climate problems affect food production. As the scales of power once again tip back from West to East, these two comrades-in-arms have manoeuvred their way to dominate the world’s essential energy resources. Let’s not forget how Europe alongside the US conspired against them during the cold war years and caused the Soviet economic crash – because I am sure the ex KGB agent, Mr Putin certainly has not.